"OMG, OMG, OMG,"...that is what my youngest daughter said when I opened a box from JAKKS Pacific on Friday and pulled out the Nintendo Super Mario Dungeons Diorama Set. Thanks to my husband, who bought the girls a mini Nintendo that was pre-loaded with old games from way back when, he has got the girls hooked on our favorite childhood Nintendo games including Super Mario Bros. My youngest likes Luigi from Super Mario. and even dressed like him for Halloween this past year. She was hoping my husband would have dressed as Mario, but he chickened out last minute, as he didn't want to look silly. Too bad, as they would have looked cute together as the Super Mario Bros. :-) Maybe next year. So, why was my daughter so excited about this diorama set from JAKKS Pacific? 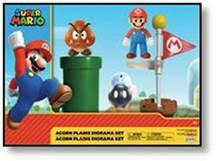 First, come on this is Super Mario..anyone who grew up in the 80's and 90's loved (and still does) Super Mario. I remember playing the original arcade game up at Funspot in Weirs Beach, NH. I had saved all my quarters to spend an afternoon playing this game with my brothers, in hopes of beating it. After a few years, we eventually did, and boy was that a fun day. All the kids in the arcade were circling around the machine as they watched us reach the end, and get our initials on the top leader board. :-) Ahh, the good 'ole days. and the spinning fireball actually moves, too! Another reason why my daughter was so excited about this toy is that you can recreate your favorite action scenes from the video game with these authentic toys from JAKKS. As you can see in the picture, this particular set comes with the pipe that Mario squats and goes down into, where you collect more gold coins, or take a short cut in the game, and pop up through another pipe in a particular level. My daughter had to show just how Mario squats, as if I didn't know. 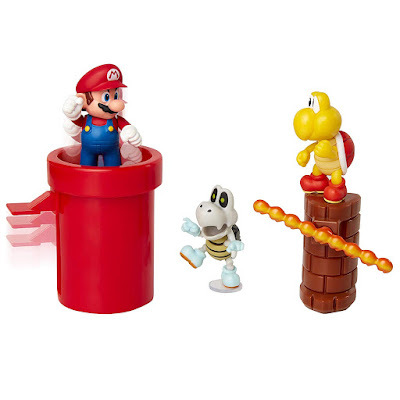 :-) And, when she wasn't pretending to go down a pipe, she was excited and couldn't stop talking about how this particular set included Koopa Troopa, one of her favorite characters in the game, next to Mario, Luigi and the Princess, of course! I couldn't get over how well made this diorama toy set was. It really did look authentic, and something collectors and kids alike would love to own and play with, or display and admire. I knew my daughter was not up for keeping this toy in the box, as she couldn't wait to get her hands on the pieces. And, within a matter of minutes she had the box open and the 5 figure diorama set set up just right, ready to show off to everyone and then play with. Being a fan of this video game, I, too, was excited to see the red warp tube and the fireball windmill. 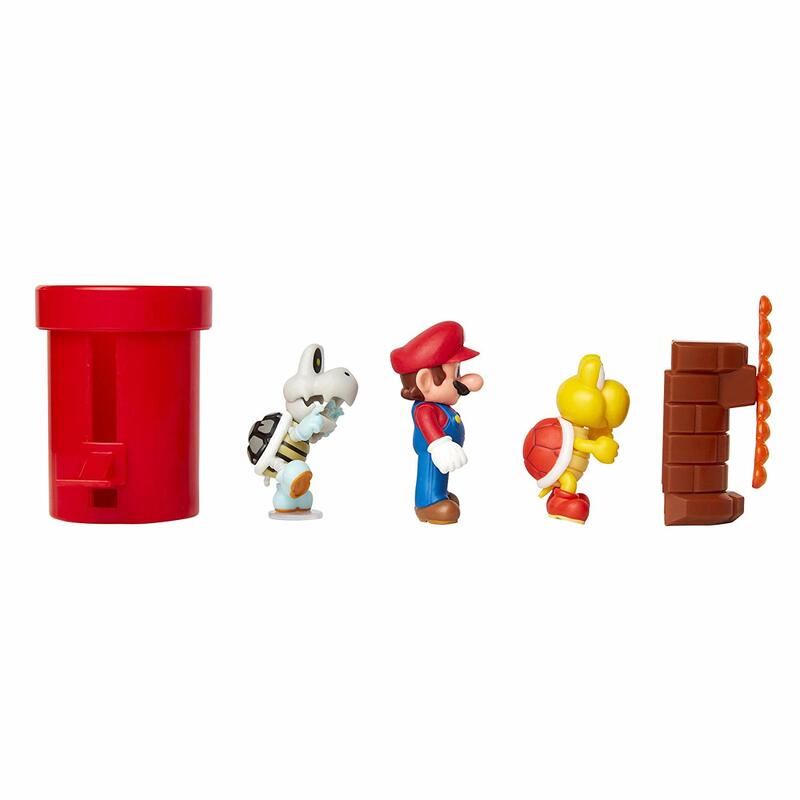 I don't know about you, but I lost right at the end of level when I hit the fireball windmill with a small-sized Mario. 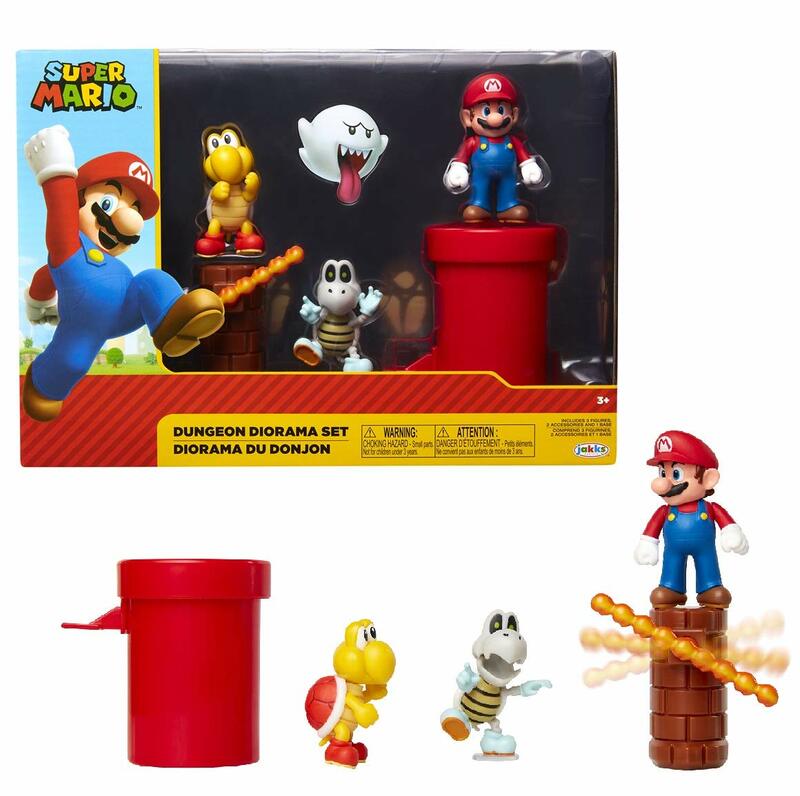 It wasn't my favorite thing from the game, but seeing that I wasn't playing it in game mode, I did have fun giving the fireball windmill a spin, while playing with the Super Mario diorama set with my daughter. As I mentioned above, I ended up buying another diorama set for my husband, and he wouldn't stop playing with my daughter's set, and she wanted him to get his own. 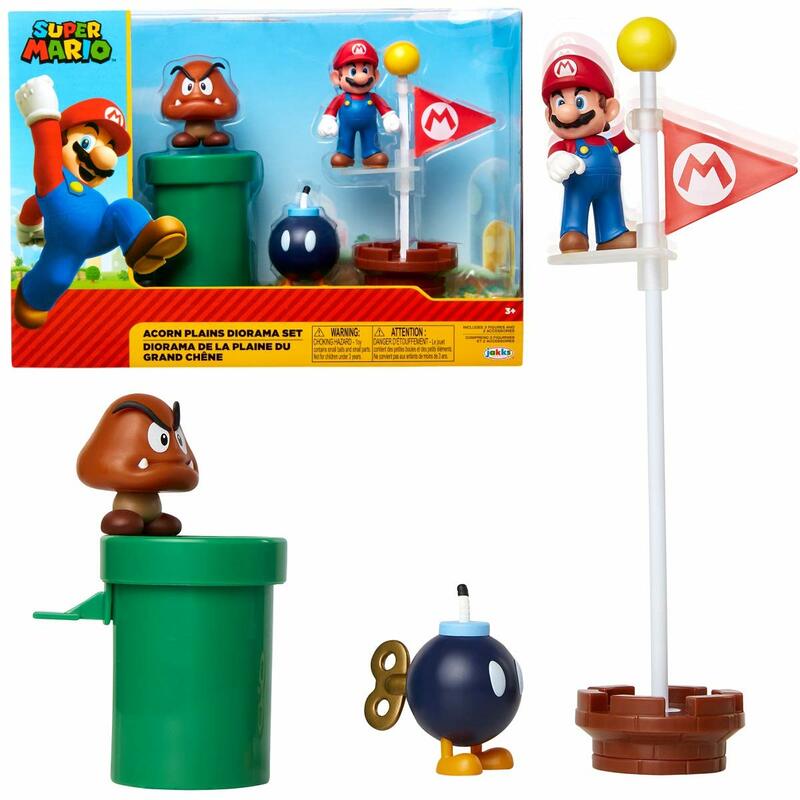 I went onto Amazon and found that they also have two Acorn Plains diorama sets. 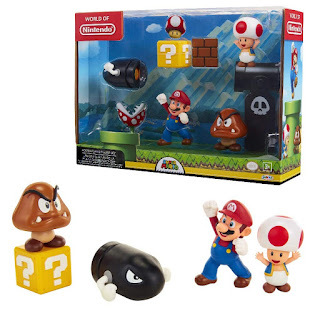 One comes with Bullet Bill, while the other comes with the Flag Pole. I ended up getting the Flag Pole Diorama Set as I knew my husband loved the end of the levels and jumping high on the flag pole to get extra points. Plus the bom-omb figure was just too cute not to get. 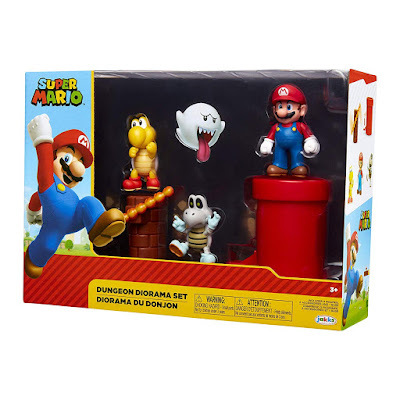 My husband plans to bring this diorama set to his office to leave on his desk, and knows most of his friends will be stopping by to check it out, and wanting to play with it, as they, too, are still huge Super Mario fans. To learn more about these and other cool Super Mario toys from JAKKS, head on over to https://www.jakks.com/products/nintendo/.